Traffic influences the type of flooring. People tend to go for carpet in bedrooms and in living areas whereas marble flooring is an ideal choice for kitchens. Some locations and suitable flooring for them are following. Kitchen floors take a lot of wear and tear. So the flooring should be water resistant, durable, fire proof, Bacteria free and easy to wash. The following are suitable flooring for kitchens. This flooring is durable, easy to wash, but requires periodic polishing to maintain shining. The choice is limited to natural colors and to colors of the chips. It is slippery when wet. This flooring is an ideal choice for kitchens as this is easy to clean and wipe. This flooring is hard and durable, stain free and fire resistant. This flooring is also a good choice for kitchens. Tile flooring is strong, stain free, scratch resistant, bacteria free, fire proof, anti-slip and easy to wash. Ceramic tile flooring does not require any polishing. 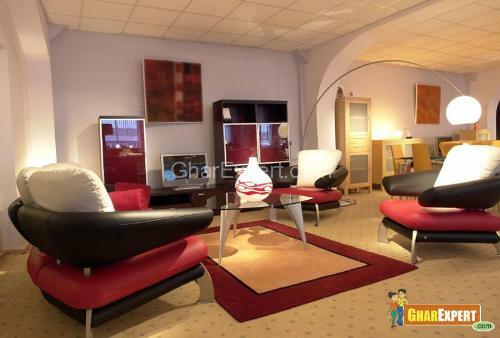 It has very long life and provides various combinations in terms of designs, colors and finishes. 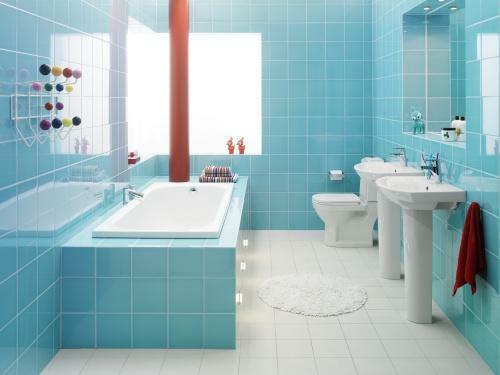 A bathroom is a place where a person can feel relaxed and comfortable. It needs special flooring as it refreshes our body and mind. The following flooring is laid in a bathroom. This flooring is durable, easy to wash, but requires periodic polishing to maintain shining. The choice is limited to natural colors and color of the chips. It is slippery when wet. This flooring is also ideal choice for bathrooms as this is easy to clean and wipe. This flooring is hard and durable, stain free and fire resistant. This flooring is also a good choice for bathrooms. Tile flooring is strong, stain free, scratch resistant, bacteria free, fire proof, anti-slip and easy to wash. Ceramic tile flooring does not require any polishing. It has very long life and provides various combinations in terms of designs, colors and finishes. Bedroom is a place where flooring should be beautiful as well as comfortable. The following are flooring for bedroom. This flooring is also good choice for bedroom as this is easy to clean and wipe. This flooring is hard and durable, stain free and fire resistant. This flooring is a good option for bedrooms. Tile flooring is strong, stain free, scratch resistant, bacteria free, fire proof, anti-slip and easy to wash. Ceramic tile flooring does not require any polishing. It has very long life and provides various combinations in terms of designs, colors and finishes. 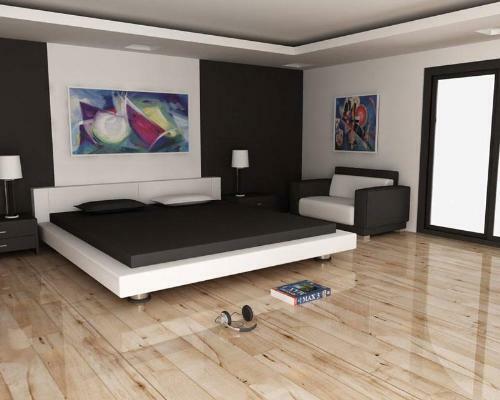 This type of flooring is also ideal flooring for bedroom. It is noise less and provides good insulation to room. This flooring does not get heated during summer and also does not get cool during winter like other floorings. The occupants can use the room bare footed. Note: Rolling furniture such as chairs, TV stands etc. can damage finishing very quickly if used regularly. Make sure that floor is protected or rollers are not made of metal or other damaging materials. Regular maintenance is required. Living room is a place where you spend most of your time. So the flooring should be durable and comfortable. The following floorings are laid in a living room. This flooring is also good choice for living room/lobby as this is easy to clean and wipe. This flooring is hard and durable, stain free and fire resistant. This flooring is also a good choice for living room/lobby. Tile flooring is strong, stain free, scratch resistant, bacteria free, fire proof, anti-slip and easy to wash. Ceramic tile flooring does not require any polishing. It has very long life and provides various combinations in terms of designs, colors and finishes. This type of flooring is also ideal flooring for living room/lobby. It is noise less and provides good insulation to room. This flooring does not get heated during summer and also does not get cool during winter like other floorings. The occupants can use the room bare footed. These tiles are backed by latex and are comfortable to walk on. They are flexible and easy to handle and lay. They come in many colors and designs. It is ideal for maintaining clean room condition. It is calendered laminated solid resilient, unbreakable and flexible PVC vinyl flooring with properties of high wear resistance and resilience.